Striker and goalkeeper deemed surplus to requirements at Easter Road. Hibernian have released Ricardo Vaz Te and Jakub Divis after deciding not to offer the pair extensions to their existing contracts. 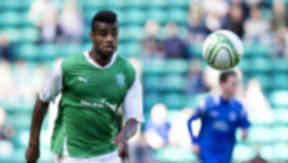 Former Bolton forward Vaz Te had joined Hibs in February and made 10 appearances for the club in the latter part of the season. However, the surprise signing of Garry O’Connor means Colin Calderwood has opted not to keep Vaz Te. "Ricardo's deal was until the end of the season," Calderwood said. "He was able to come up and help us during the latter stages of the season. When it came to the end we knew we would shake hands and walk away." Goalkeeper Divis had arrived in Leith in January but the Czech only wore the Hibs jersey three times in his short stay. "We had an option with Jakub and we didn't take that up," Calderwood confirmed. The club have three goalkeepers on their books following Divis’ departure but, with Vaz Te released and Derek Riordan and Kurtis Byrne leaving the club, Akpo Sodje and O’Connor are the only forwards in Calderwood’s squad. The manager said that was a situation he intended to rectify and would be keen on adding more firepower to his team. "We've almost got more goalkeepers than strikers,” he said. “It is the one part of the team where we're short. "We've started with a really big signing for lots of reasons. What we add will be focused on complementing Akpo Sodje and Garry up front."